Spice up your backyard with one of our cute and nostalgic retro gnomes. Our collection includes playful 1950s figures and psychedelic 1960s and 1970s hippie gnomes. 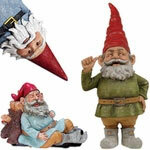 Choose from our famous character retro gnomes to add a familiar face to your garden or home. Our gnomes are designed to withstand the elements, but are also perfect to decorate indoors. Each gnome is made with a weather-resistant cast stone resin that withstands the elements so that their colors don’t fade and their paint won’t wear off. Add a hippie dude and hippie chick to your yard for a mellow and groovy touch. 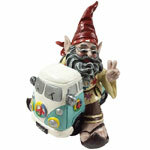 These psychedelic gnomes will add some flower power to your gardening work! 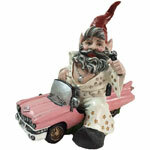 For the pink lady in your life, choose from our Route 66 Diner gnome or our poodle skirt gnome. 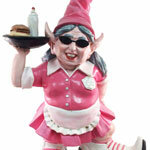 Our Route 66 waitress gnome comes complete with a tray of food, pink and white roller skates and a retro pink uniform. Your guests will love her burgers and milkshake. Pair our diners gal with our poodle skirt gnome. This adorable gnome looks ready for the sock hop. Each poodle skirt gnome comes with a pink cap, saddle shoes and a classic pink scarf tied to the side. Her 1950s style cat eye glasses complete her retro look. Every man wants to be just like The Fonz. Our Arthur Gnomebert Fonzarelli statue will make all the ladies jealous. His leather jacket and rolled jeans are as cool as ever. The pool shark gnome is the perfect friend to pair with your Fonz statue. This classic 1950s greaser look will match your other retro gnomes to complete your collection. Our letterman jock and Poindexter nerd gnomes are the counterparts to our hell-raising Fonz and pool shark figures. Upgrade your backyard landscape with a retro gnome for luck and protection. While our classic gnomes are fun and familiar, these add a more personalized look to your home.